Dan-A31 had the most liked content! I am very interested in this also. Any info/advice would be greatly appreciated. Might be an SR20 in a Civic... They pull a premium one week before race wars. Fiberglass front bar - Stone chips! 3M protective film might be the way to go. Awesome! Hope you get it ready & see you out there. Where you in group B for May's Matsuri? Nah group C man Ah cool man, thought you were in the same group as me. There was another 33 like yours in B. What group will you go in for Septembers Matsuri? Awesome! Hope you get it ready & see you out there. Where you in group B for May's Matsuri? Get a media pass & head to to Matsuri in september! Looking good man. Will this be ready for September Matsuri? Ok, where to start! Learned to drive in mums 2001 Suzuki Ignis First car owned: 1985 Cordia Turbo Followed by: 1990 180sx 1991 R32 GTR 1988 Cefiro 1999 JZX100 Mark II 2000 Stagea RS4S 1988 Cefiro (Current skid car) Daily cars/tow cars owned 1989 XF Falcon ute 1990 N13 Pulsar 1993 N14 Pulsar (current daily 1990 Pajero (current tow car) Prob more ive forgotten about. 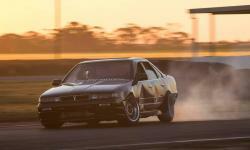 Best place to buy a car trailer in sa for low drift spec cars? Before I bought a T/D Pajero I used to borrow my mates 1998 2.7ltr petrol single cab hilux. Surpisingly it towed really well. That cage is a work of art man! To sum up the quality of your build is just simply amazing. Top work mate, cannot wait to see the finished product! Is the car scene better now or was it better ten years ago? Just reading that brought back some good memories. If you ever want another project build, my Cefiro needs some love Awesome build mate, really inspiring. As an A > B car, non-turbo S13 would make a great car. Cheap, reliable & easy to work on. If this is a well looked after example, just general maintenance will keep it running for years.